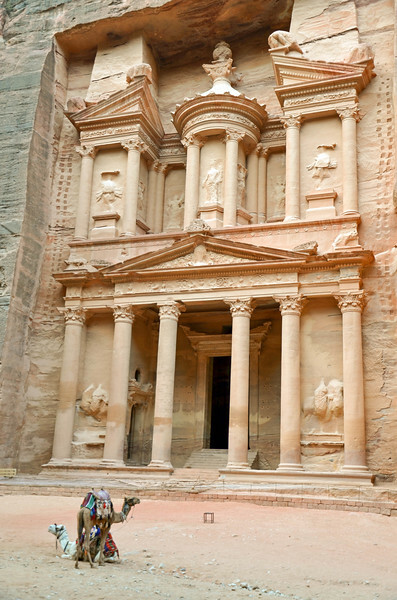 Established as early as 312 BC, Petra was the capital city of the Nabataeans. 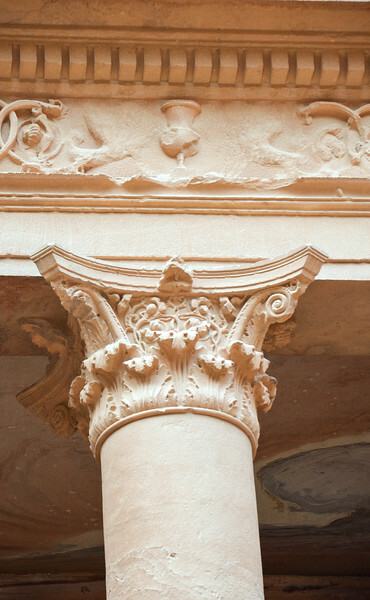 This large site, hidden deep within the mountains, was unknown to most of the world until 1812. 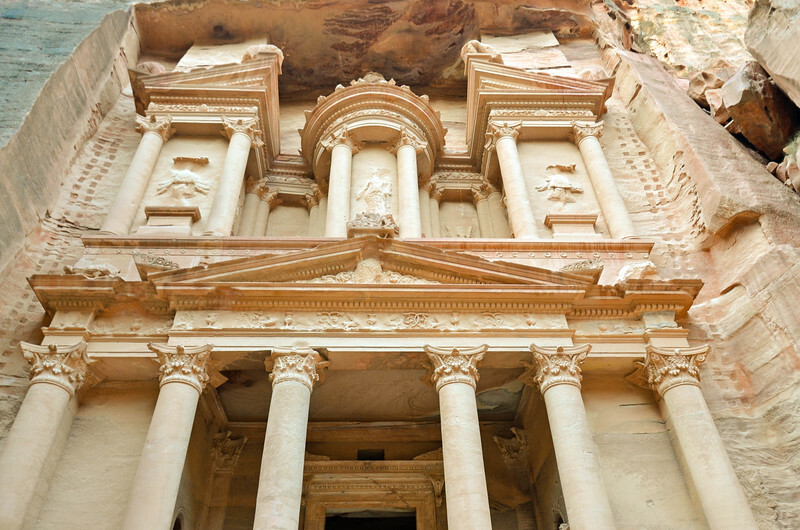 The city is known for its large façades carved into the cliffs and mountains, including the Treasury, its signature monument. 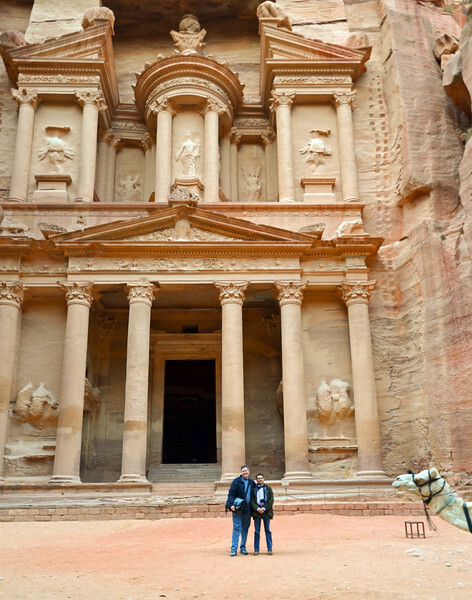 We spent a full day exploring Petra, Jordan's most popular attraction. 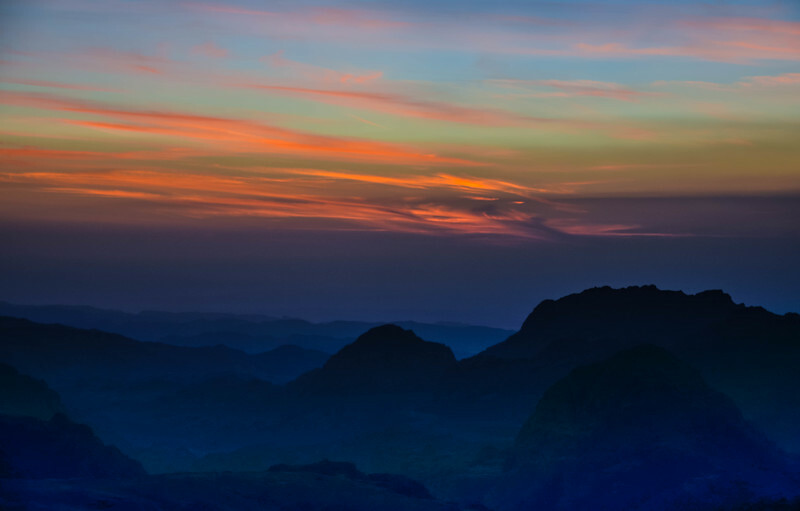 Sunset over the mountains at Petra, as seen from our room at the Marriott Petra. 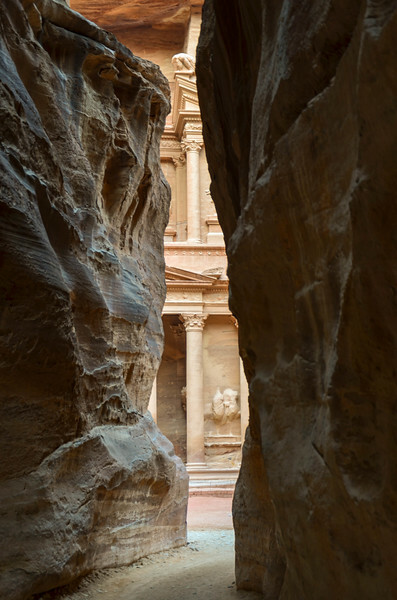 Approaching the Treasury at the end of the Siq. 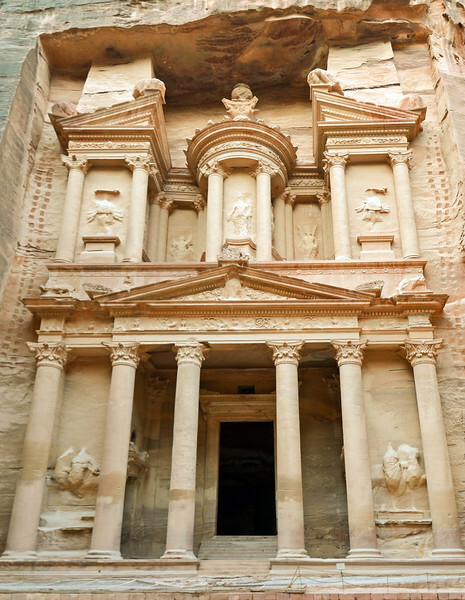 The Treasury, Petra's signature monument. Brian and me in front of the Treasury. 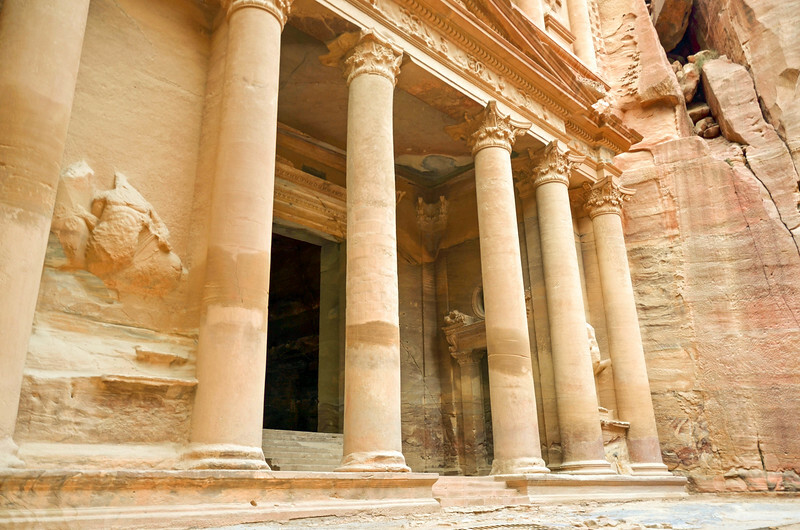 Camels rest in front of the Treasury before beginning their work of carrying tourists. 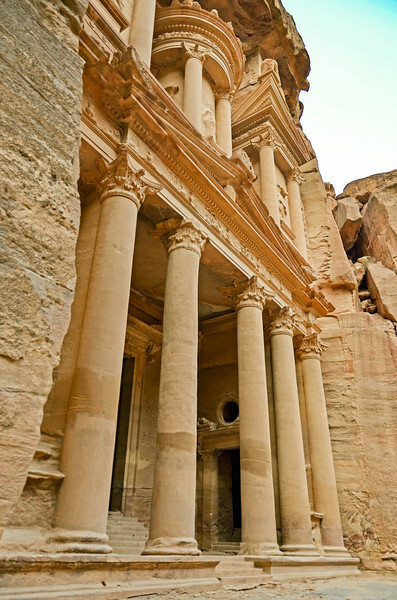 The front of Al Khazneh, the Treasury, in Petra. 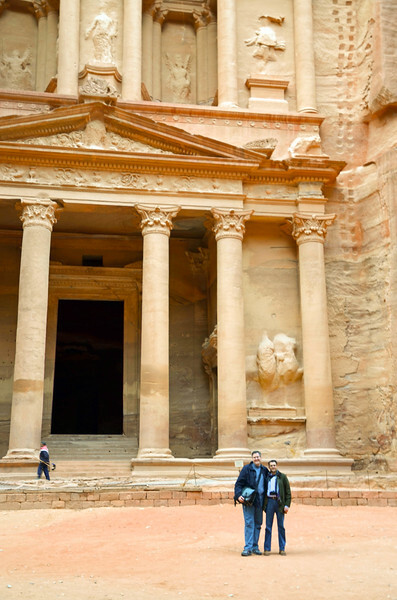 A tourist poses in costume with the camels in front of the Treasury. 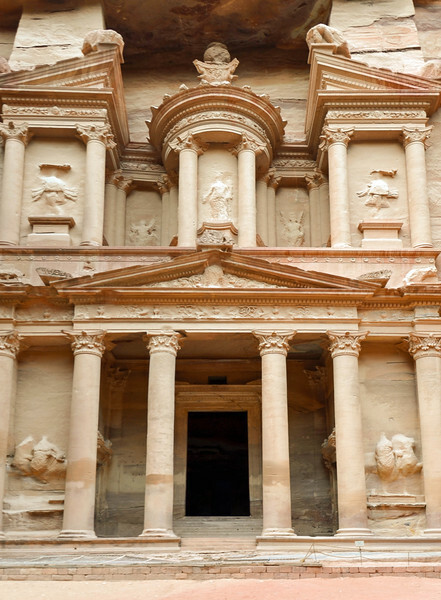 Camels in front of the Treasury in Petra. 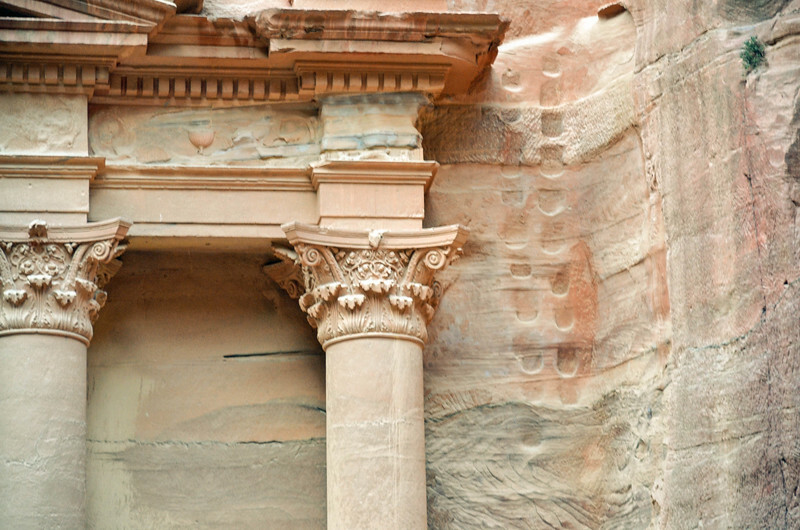 Closeup detail of the façade of the Treasury in Petra. 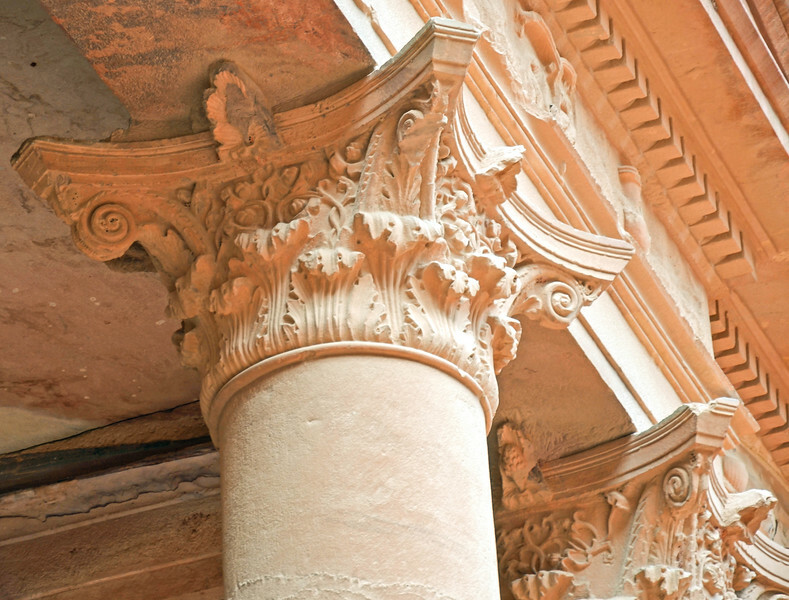 Columns along the façade of the Treasury in Petra. 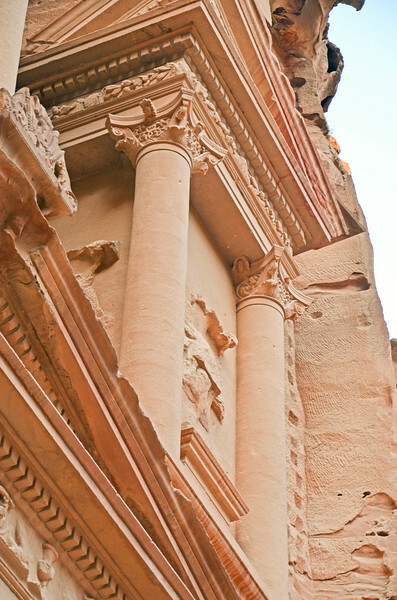 The façade of the Treasury in Petra. One of the Djin Blocks. 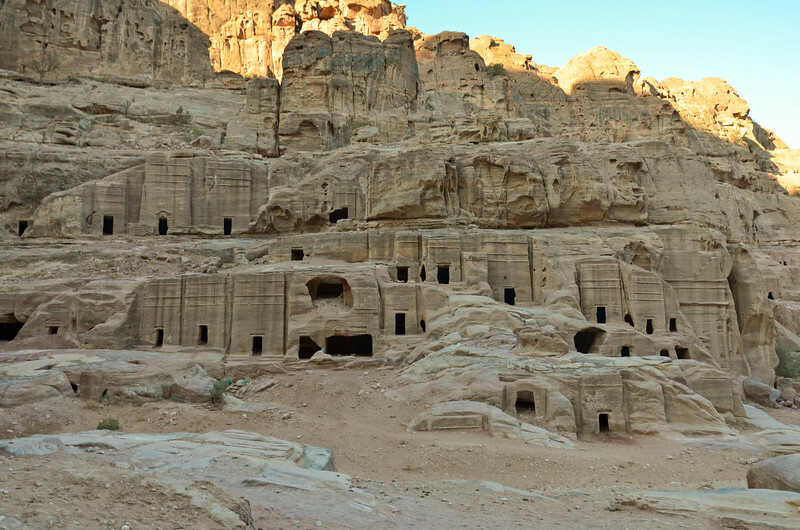 These are square monuments carved out of the mountainside. 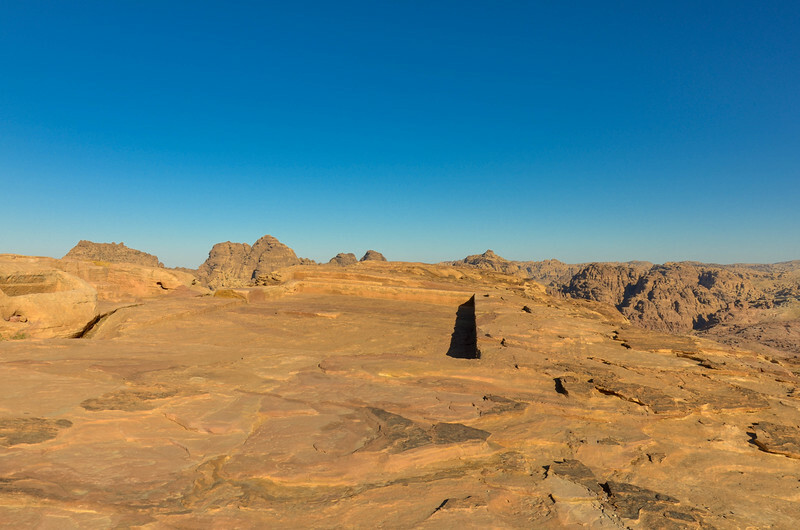 The obelisk tomb, one of the first major monuments visitors encounter in Petra. 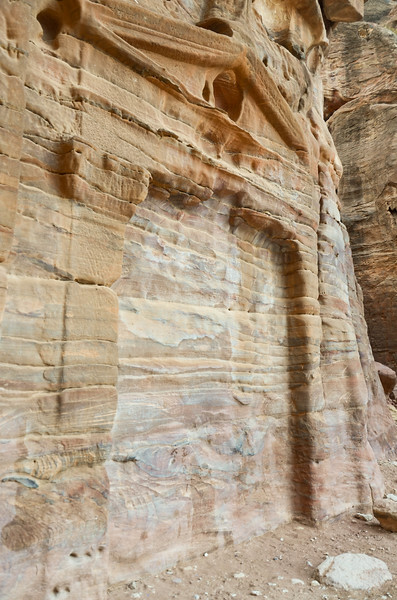 Approaching the entrance gates at the opening of the Siq. Tne entrance to the Siq. 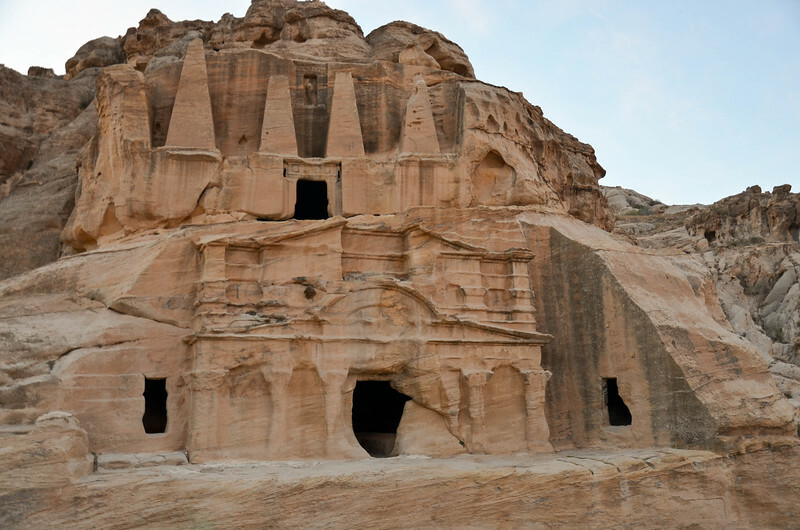 A tomb in Petra on the Street of Façades. 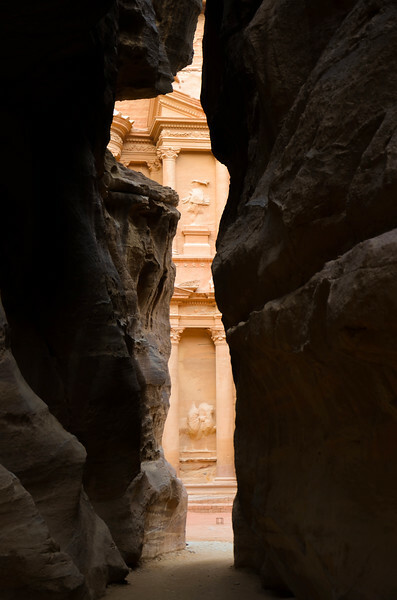 The Siq, with some of the original paving visible. 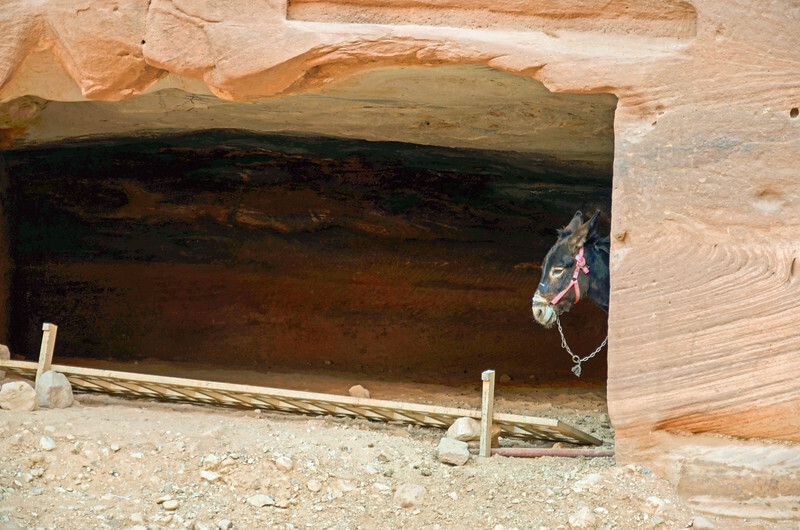 A mule in one of the Petra caves. 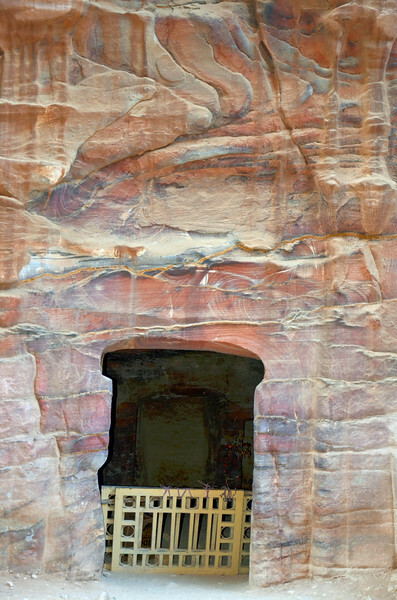 One of the carvings in the wall of the Siq. 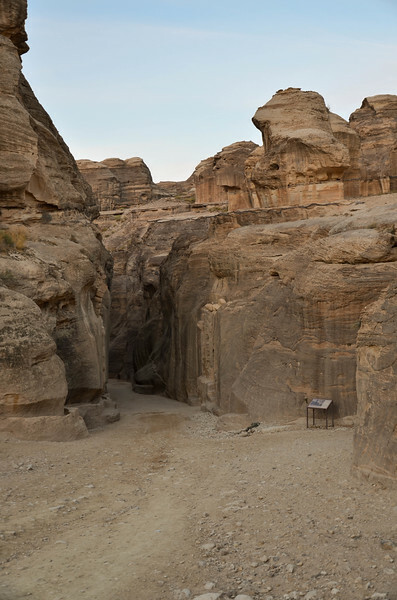 Gravesites inside one of the Petra tombs. 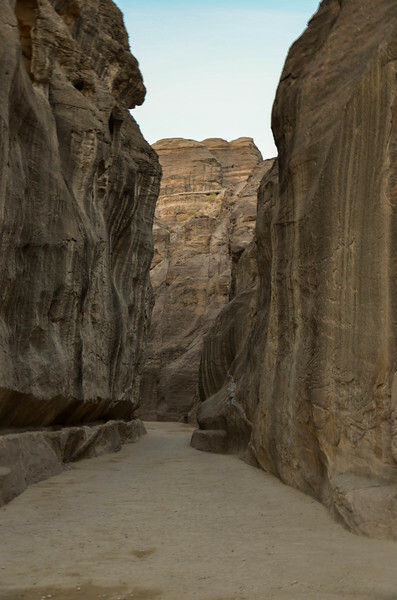 The Street of façades in Petra. 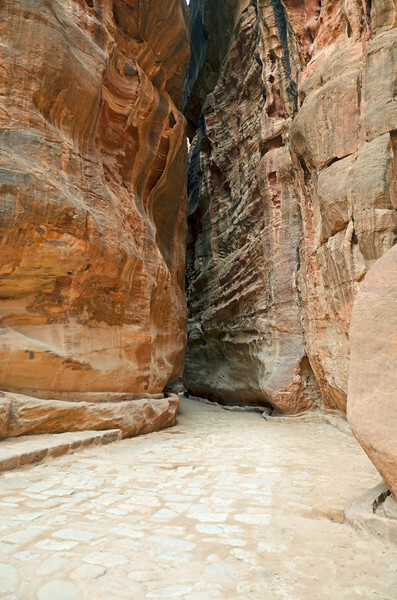 The Siq narrows, with some of the original paving visible in this section. 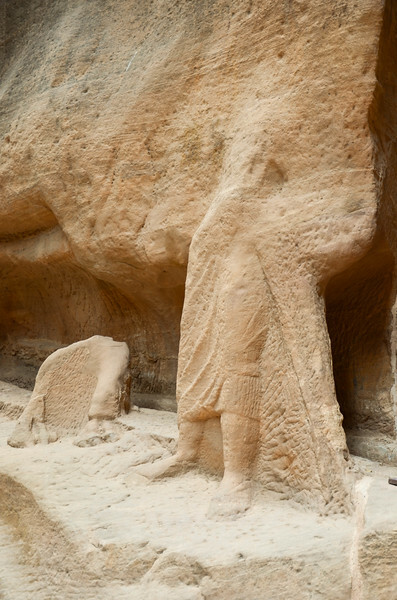 Statues of people, carved out of the rock in the Siq, with the water channel passing behind them. 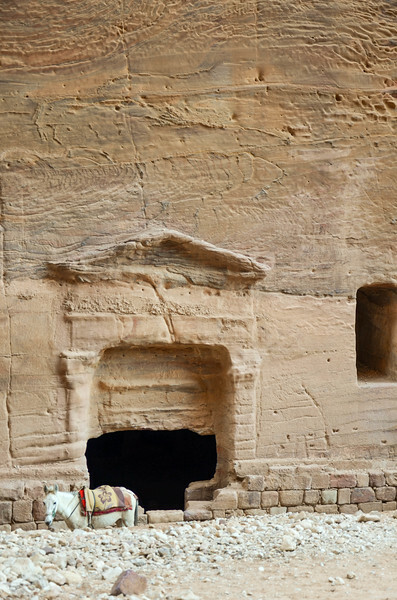 Ancient stairs carved out of the rock, leading up to tombs in the Siq. 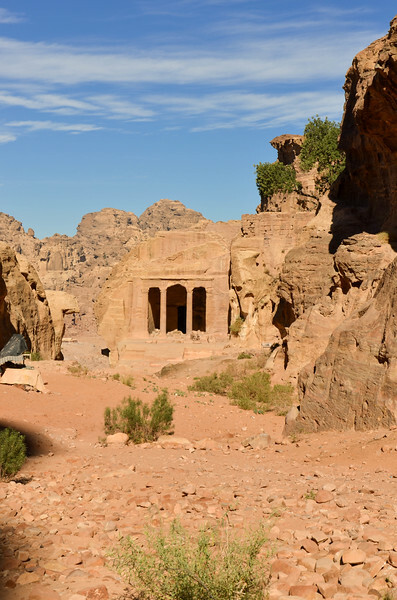 A tomb along the Street of Façades in Petra. 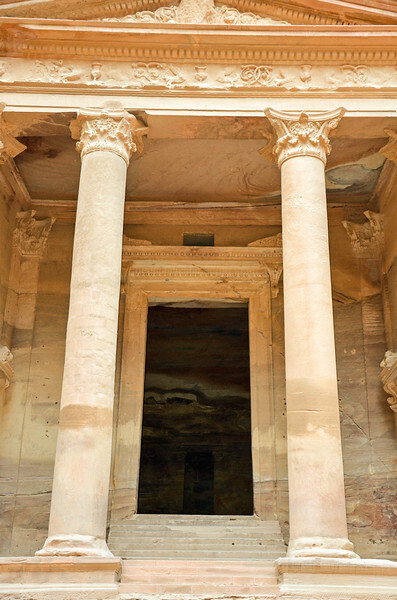 Inside one of the Petra tombs. One of the souvenir venders had supplies stored in the cave. 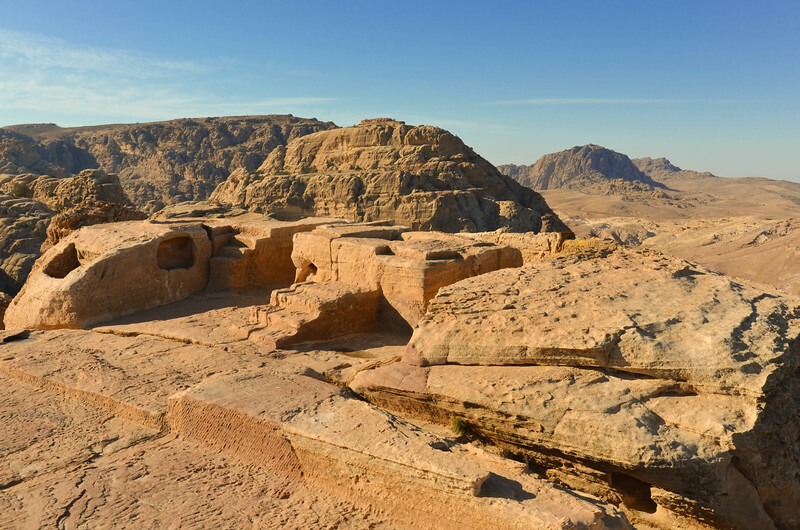 The Royal Tombs in the distance, as seen from the High Place of Sacrifice. 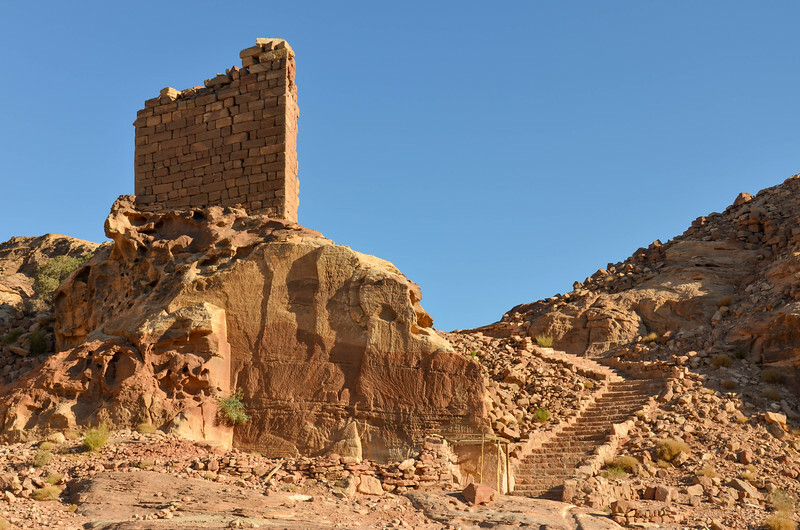 Part of the Crusader Fort ruins, along with the stairs leading to the summit and the High Place of Sacrifice. 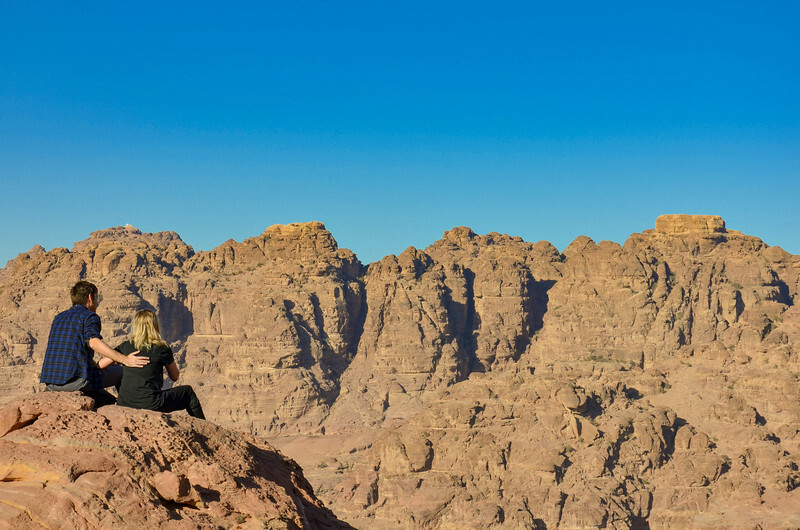 A couple looks out over the valley and mountains from the High Place of Sacrifice trail. 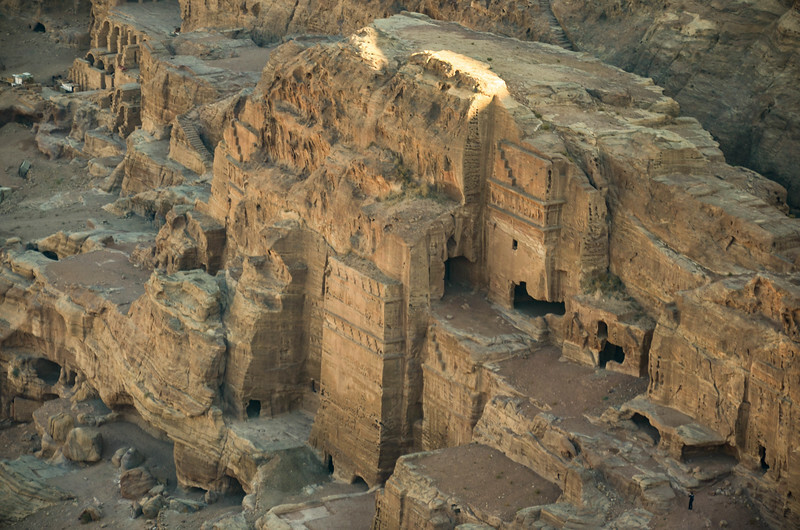 Numerous tombs are visible in all directions from the High Place of Sacrifice. 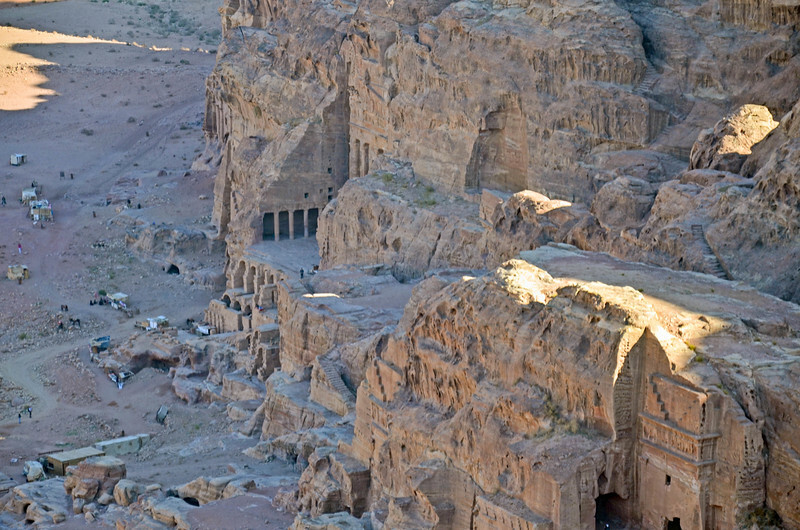 Looking down on the Street of Façades from the High Place of Sacrifice. 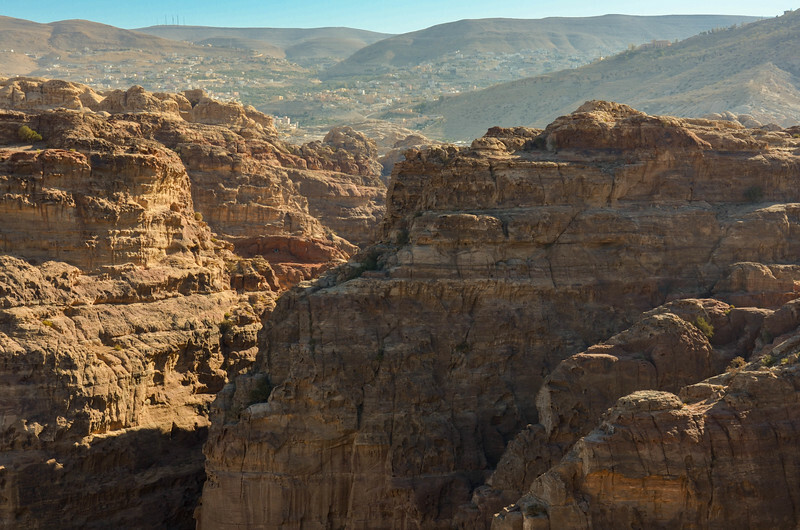 Mountains and canyons, with the modern town of Wadi Musa in the distance. The Garden Tomb. The area in front of it once held gardens and a large public plaza. Stairs lead to a tomb along the Wadi Farasa Trail, near the Garden Tomb. 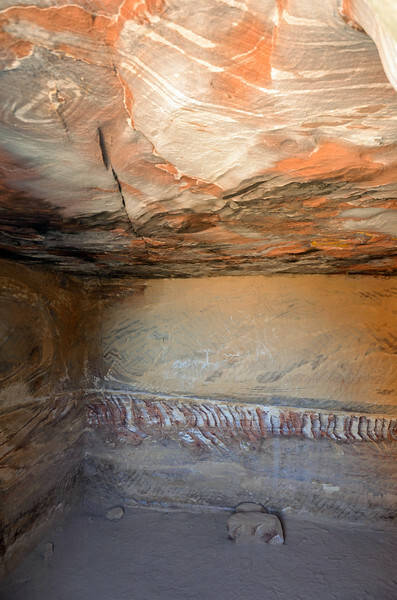 The interior of one of the tombs. 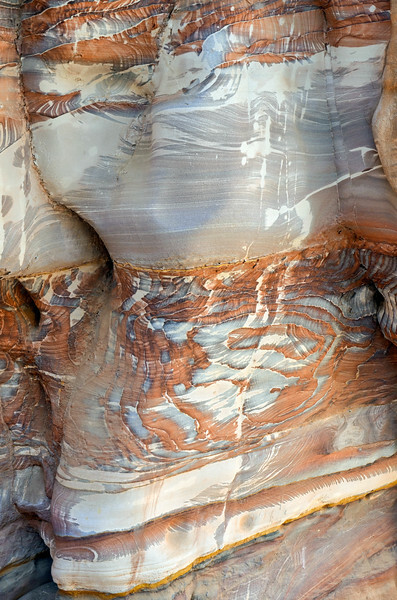 The colorful markings on the rocks are not painted; the rocks in this area naturally have this appearance. 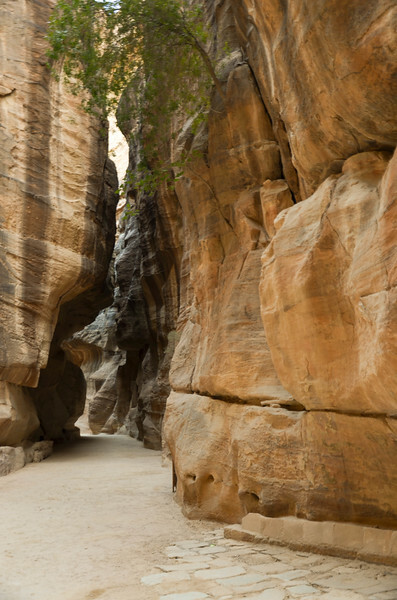 Rocks along the Wadi Farasa trail.